OPERATING ERA: 1944 to 1972. This Kit now comes with our new One-Piece Roof Frame. 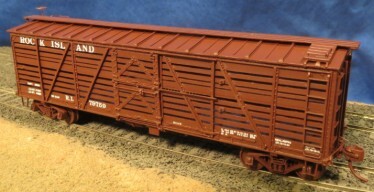 The Rock Island converted B-2 Box Cars into Stock Cars starting in 1944. The first 200 cars #7700-77199 had a different side slat configuration than the later converted 320 Cars.